Dumplings are Indonesian cuisine influenced by Chinese people who immigrated to Indonesia since a very long time. The word comes from the word Siomay shaomai, a kind of dumpling commonly known as dim sum. Dumplings have been incorporated into the cuisine of Indonesia for a long time, and the most famous is Siomay Bandung. Bandung dumplings have been adapted into local Sundanese cuisine. Currently, most sellers Siomay is in the Sundanese. 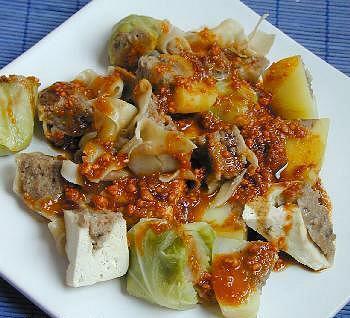 Other types of dumplings called Batagor, also from Bandung that is short of Baso Fried Tofu. Siomay Batagor very similar, but the difference is Batagor while Siomay steamed fried. Dumplings are usually made from fish meat mackerel. Sometimes other types of seafood such as tuna, mackerel and shrimp can also be used to make dumplings. Other materials used to complete the dumplings are cabbage, potatoes, and steamed out. Dumplings and supplementary materials are presented by way of cut and higher are given a peanut sauce, soy sauce, chili sauce and a little lime juice.